The Barton and Doomy Law Firm is a criminal defense, traffic, and civil litigation firm based in Salisbury, North Carolina. Though based in Salisbury, our firm handles matters in a geographic area ranging from Charlotte to Winston Salem along the Interstate 85 and Interstate 77 Corridors. Our lawyers are lifelong North Carolina Residents committed to straightforward representation of our clients in both criminal and civil matters. Our goals are to protect the rights of the criminally accused and to simplify civil litigation for our clients. No matter what the criminal charge, traffic ticket, or other legal issue you face, you can count on our lawyers to take the guesswork out of the equation by giving you a straight shooting perspective on your case. If you are charged with a crime, don’t waste time. Many people feel that they are aware of their rights, but even so it’s more challenging to protect those rights in a courtroom. Let us put our knowledge and experience to work helping you protect your rights. Criminal charges can carry great potential to disrupt your life and eat up valuable time and money in court. Some charges may even affect your ability to obtain employment and education, not to mention that a conviction can alter your fundamental rights. 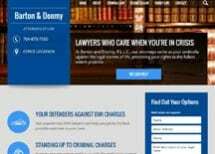 Our lawyers give each client 100%, regardless of the charge. Our firm does our best to protect your rights whether it is a minor speeding ticket/ reckless driving, or a third offense DWI/DUI. If you or a family member has been charged with a crime, don’t hesitate for a second to call us. Remember that your time is valuable too, let us put our experience to work for you and we will spend our time so you don’t have to. Call us today at 704-433-0300. We offer free initial consultations for traffic ticket (speeding) cases. For your convenience we accept all major credit cards and can take payments by phone.